For the first day of the most exciting expedition to the white continent, we sailed on the eastern side of the south island of New Zealand. This provided us with protection from the high waves of the Southern Ocean that we were sure to encounter sooner or later. The first couple of days were filled with meetings and lectures ranging from science to safety. We had pleasant weather and wonderful sunsets. 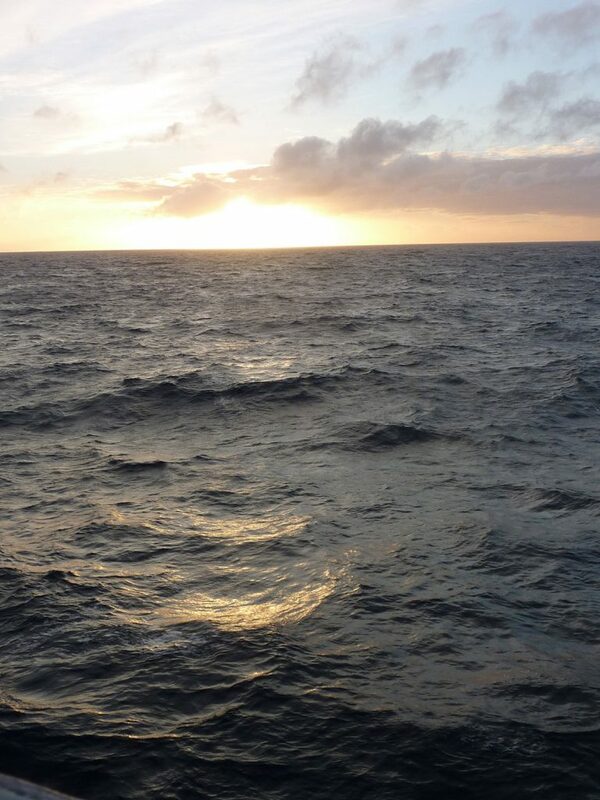 Sometime during the late evening of the second day, we started to feel the affects of the long fetches and strong winds of the Southern Ocean as waves quickly increased. By morning, ocean had become an angry scene of rolling white caps, with the waves being up to 15 feet high making for an incredible scene of raw beauty that only nature can produce. During the day, I went out to the deck every hour so to get a good view. Firstly, for adventure and second to keep me from getting seasick. Also, when the wave heights permitted I went up to the bow to ride the waves at the very front of the ship. The colors of the ocean seem to contain all sorts of hues of blues, greens and whites, often rising up high almost reaching eye level, especially the spray. These greenish blue walls of water were capped with foaming mounds of white that were whipped by the wind and sheared off by the screeching winds into a mist that would soak all those near the front of the ship. Later in the day, I was able to get to the front of the ship without getting soaked from showering of water from the exploding waves against the bow. I then was able to spy the raging waves as they approached from far in the distance. These waves may have started from something as peaceful as from a light breeze in the far distance, but now the stinging winds that were blowing across these cold waters have created waves that bring both awe and a respectful fear into anyone watching them. These might traveling mounds of water continuously struck the ship’s bow with unrelenting force, exploding into a water falls like cascade that poured water over the bow, resulting in a wave of water rolling down the deck. One had to be careful of when and where to walk or be ready for a wet foot or face.